Our world of work is undergoing fundamental change in the wake of digitalisation. What will this mean for vocational education and training? Representatives of VET from Germany and five partner countries discussed this topic on the BMBF's Peer Learning Platform organised by GOVET. Digitalisation is changing our everyday working lives and our occupations by introducing new processes and shifting requirements in the form of elements such as robots, drones and computer-aided tools. Although these developments are creating new risks and challenges all over the world, they are also bringing new opportunities for the world of work and for vocational education and training. As part of the programme of events at the 2018 didacta, Europe’s largest educational trade fair, VET experts and policy-making specialists from China, Mexico, Russia, South Africa and the USA came together with their German partners to stage a special three-day International Peer Learning Platform. They networked on the questions of how each country can address its own specific challenges and of how international cooperation can support the development of sustainable VET systems which meet labour market needs are able to open up education, training and employment chances for young people. The Federal Ministry of Education and Research (BMBF) has had cooperation agreements in place with the countries concerned for several years. Joint topics covered range from the establishment of dual training structures to the development of curricula and also extend to include vocational education and training research. GOVET acts on behalf of the BMBF to advise these countries and support them in the further development of their vocational education and training systems. The main focus of the peer learning event, which involved non-European partners for the first time, was on learning from one another. The partners used the occasion to report on the successes they had achieved in transforming VET within their countries and to identify possible areas of common action. As well as hearing keynote addresses from Christiane Reuter of the Federal Institute for Vocational Education and Training and from employer and employee representatives, participants worked in interactive formats to address topics such as national system development in VET, requirements being made of trainers as a result of Industry 4.0, and permeability between various educational pathways. 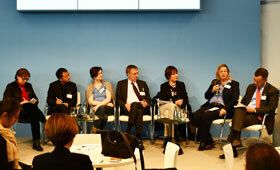 The International Peer Learning Platform was hosted by the BMBF and organised by GOVET. GOVET works on behalf of the BMBF to provide specialist support for bilateral VET cooperation agreements that are currently in force with 16 countries. The international expert debate revolved around topics on which the international VET partners are seeking to concentrate in future. GOVET will be providing specialist advice on implementation. In the slideshow below we provide a look at the topics on which the countries are presently focusing. Detailed documentation of the event will be made available on the GOVET website shortly. China is addressing the issue of how innovations can be integrated into initial and continuing vocational education and training. There are plans to establish a Chinese-German vocational education and training platform. GOVET was represented at the didacta 2018 with a booth. Numerous international visitors gained information about the activities of GOVET.